For other uses, see Sparrow (disambiguation). Sparrows are a family of small passerine birds. They are also known as true sparrows, or Old World sparrows, names also used for a particular genus of the family, Passer. They are distinct from both the American sparrows, in the family Passerellidae, and from a few other birds sharing their name, such as the Java sparrow of the family Estrildidae. Many species nest on buildings and the house and Eurasian tree sparrows, in particular, inhabit cities in large numbers, so sparrows are among the most familiar of all wild birds. They are primarily seed-eaters, though they also consume small insects. Some species scavenge for food around cities and, like gulls or rock doves will happily eat virtually anything in small quantities. Generally, sparrows are small, plump, brown and grey birds with short tails and stubby, powerful beaks. The differences between sparrow species can be subtle. Members of this family range in size from the chestnut sparrow (Passer eminibey), at 11.4 centimetres (4.5 in) and 13.4 grams (0.47 oz), to the parrot-billed sparrow (Passer gongonensis), at 18 centimetres (7.1 in) and 42 grams (1.5 oz). Sparrows are physically similar to other seed-eating birds, such as finches, but have a vestigial dorsal outer primary feather and an extra bone in the tongue. This bone, the preglossale, helps stiffen the tongue when holding seeds. Other adaptations towards eating seeds are specialised bills and elongated and specialised alimentary canals. The family Passeridae was introduced (as Passernia) by the French polymath Constantine Samuel Rafinesque in 1815. Under the classification used in the Handbook of the Birds of the World (HBW) main groupings of the sparrows are the true sparrows (genus Passer), the snowfinches (typically one genus, Montifringilla), and the rock sparrows (Petronia and the pale rockfinch). These groups are similar to each other, and are each fairly homogeneous, especially Passer. Some classifications also include the sparrow-weavers (Plocepasser) and several other African genera (otherwise classified among the weavers, Ploceidae) which are morphologically similar to Passer. According to a study of molecular and skeletal evidence by Jon Fjeldså and colleagues, the cinnamon ibon of the Philippines, previously considered to be a white-eye, is a sister taxon to the sparrows as defined by the HBW. They therefore classify it as its own subfamily within Passeridae. Many early classifications of the sparrows placed them as close relatives of the weavers among the various families of small seed-eating birds, based on the similarity of their breeding behaviour, bill structure, and moult, among other characters. Some, starting with P. P. Suskin in the 1920s, placed the sparrows in the weaver family as the subfamily Passerinae, and tied them to Plocepasser. Another family sparrows were classed with was the finches (Fringillidae). Some authorities previously classified the related estrildid finches of the Old World tropics and Australasia as members of the Passeridae. Like sparrows, the estrildid finches are small, gregarious and often colonial seed-eaters with short, thick, but pointed bills. They are broadly similar in structure and habits, but tend to be very colourful and vary greatly in their plumage. The 2008 Christidis and Boles taxonomic scheme lists the estrildid finches as the separate family Estrildidae, leaving just the true sparrows[clarification needed] in Passeridae. Despite some resemblance such as the seed-eater's bill and frequently well-marked heads, American sparrows, or New World sparrows, are members of a different family, Passerellidae, with 22 genera recognised. Several species in this family are notable singers. American sparrows are related to Old World buntings, and until 2017, were included in the Old World bunting family Emberizidae. The hedge sparrow or dunnock (Prunella modularis) is similarly unrelated. It is a sparrow in name only, a relict of the old practice of calling more types of small birds "sparrows". A few further bird species are also called sparrows, such as the Java sparrow, an estrildid finch. The sparrows are indigenous to Europe, Africa and Asia. In the Americas, Australia, and other parts of the world, settlers imported some species which quickly naturalised, particularly in urban and degraded areas. House sparrows, for example, are now found throughout North America, Australia (every state except Western Australia), parts of southern and eastern Africa, and over much of the heavily populated parts of South America. The sparrows are generally birds of open habitats, including grasslands, deserts, and scrubland. The snowfinches and ground-sparrows are all species of high latitudes. A few species, like the Eurasian tree sparrow, inhabit open woodland. The aberrant cinnamon ibon has the most unusual habitat of the family, inhabiting the canopy of cloud forest in the Philippines. Sudan golden sparrows, seen here on the Red Sea coast of Sudan, are highly gregarious outside of the breeding season. Sparrows are generally social birds, with many species breeding in loose colonies and most species occurring in flocks during the non-breeding season. The great sparrow is an exception, breeding in solitary pairs and remaining only in small family groups in the non-breeding season. Most sparrows form large roosting aggregations in the non-breeding seasons that contain only a single species (in contrast to multi-species flocks that might gather for foraging). Sites are chosen for cover and include trees, thick bushes and reed beds. The assemblages can be quite large with up to 10,000 house sparrows counted in one roost in Egypt. The sparrows are some of the few passerine birds that engage in dust bathing. Sparrows will first scratch a hole in the ground with their feet, then lie in it and fling dirt or sand over their bodies with flicks of their wings. They will also bathe in water, or in dry or melting snow. Water bathing is similar to dust bathing, with the sparrow standing in shallow water and flicking water over its back with its wings, also ducking its head under the water. Both activities are social, with up to a hundred birds participating at once, and is followed by preening and sometimes group singing. House sparrows being fed brioche in front of Notre-Dame Cathedral in Paris. Sparrows may be the most familiar of all wild birds worldwide. Many sparrow species commonly live in agricultural areas, and for several, human settlements are a primary habitat. The Eurasian tree and house sparrows are particularly specialised in living around humans and inhabit cities in large numbers. 17 of the 26 species recognised by the Handbook of the Birds of the World are known to nest on and feed around buildings. Grain-eating species, in particular the house and Sudan golden sparrows, can be significant agricultural pests. Sparrows can be beneficial to humans as well, especially by eating insect pests. Attempts at the large-scale control of sparrows have failed to affect sparrow populations significantly, or have been accompanied by major increases in insect attacks probably resulting from a reduction of sparrows, as in the Great Sparrow Campaign in 1950s China. Because of their familiarity, the house sparrow and other sparrows are frequently used to represent the common and vulgar, or the lewd. Birds usually described later as sparrows are referred to in many works of ancient literature and religious texts in Europe and western Asia. These references may not always refer specifically to sparrows, or even to small, seed-eating birds, but later writers who were inspired by these texts often had the house sparrow and other members of the family in mind. In particular, sparrows were associated by the ancient Greeks with Aphrodite, the goddess of love, due to their perceived lustfulness, an association echoed by later writers such as Chaucer and Shakespeare. Jesus's use of "sparrows" as an example of divine providence in the Gospel of Matthew also inspired later references, such as that in the final scene of Shakespeare's Hamlet and the Gospel hymn His Eye Is on the Sparrow. is based on the house sparrow. The symbol had no phonetic value and was used as a determinative in words to indicate small, narrow, or bad. Sparrows have been kept as pets at many times in history, even though most are not particularly colourful and their songs are unremarkable. They are also difficult to keep, as pet sparrows must be raised by hand and a considerable amount of insects are required to feed them. Nevertheless, many are successful in hand raising orphaned or abandoned baby sparrows. The earliest mentions of pet sparrows are from the Romans. Not all the passeri mentioned, often as pets, in Roman literature were necessarily sparrows, but some accounts of them clearly describe their appearance and habits. The pet passer of Lesbia in Catullus's poems may not have been a sparrow, but a thrush or European goldfinch. John Skelton's The Boke of Phyllyp Sparowe is a lament for a pet house sparrow belonging to a Jane Scrope, narrated by Scrope. ^ Bledsoe, A. H.; Payne, R. B. (1991). Forshaw, Joseph (ed.). Encyclopaedia of Animals: Birds. London: Merehurst Press. p. 222. ISBN 978-1-85391-186-6. ^ Clement, Peter; Harris, Alan; Davis, John (1993). Finches and Sparrows: an Identification Guide. Princeton, New Jersey: Princeton University Press. ISBN 978-0-691-03424-9. ^ a b c d e f g h i j k l m Summers-Smith, J. Denis (2009). 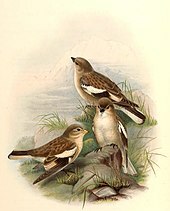 "Family Passeridae (Old World Sparrows)". In del Hoyo, Josep; Elliott, Andrew; Christie, David (eds.). Handbook of the Birds of the World. Volume 14: Bush-shrikes to Old World Sparrows. Barcelona: Lynx Edicions. ISBN 978-84-96553-50-7. ^ Bock, Walter J. (1994). History and Nomenclature of Avian Family-Group Names. Bulletin of the American Museum of Natural History. Number 222. New York: American Museum of Natural History. pp. 157, 252. ^ a b c Fjeldså, J.; Irestedt, M.; Ericson, P. G. P.; Zuccon, D. (2010). "The Cinnamon Ibon Hypocryptadius cinnamomeus is a forest canopy sparrow" (PDF). Ibis. 152 (4): 747–760. doi:10.1111/j.1474-919X.2010.01053.x. ^ Gill, Frank; Donsker, David, eds. (2018). "Old World sparrows, snowfinches, weavers". World Bird List Version 8.1. International Ornithologists' Union. Retrieved 8 May 2018. ^ Clement, Peter; Colston, P. R. (2003). "Sparrows and Snowfinches". In Perrins, Christopher (ed.). The Firefly Encyclopedia of Birds. Firefly Books. pp. 590–591. ISBN 978-1-55297-777-4. ^ Shipley, A. E. (1899). "Sparrow". In Cheyne, Thomas Kelley; Black, J. Sutherland (eds.). Encyclopaedia Biblica. 4. ^ "Starling Talk: The Care and Feeding of Injured and Orphaned Starlings". ^ Ferber, Michael (2007). "Sparrow". A Dictionary of Literary Symbols. Cambridge University Press. Archived from the original on 2013-07-24. Retrieved 2017-11-01. Houlihan, Patrick E.; Goodman, Steven M. (1986). The Natural History of Egypt, Volume I: The Birds of Ancient Egypt. Warminster: Aris & Philips. ISBN 978-0-85668-283-4. Summers-Smith, J. Denis (1988). The Sparrows. illustrated by Robert Gillmor. Calton, Staffs, England: T. & A. D. Poyser. ISBN 978-0-85661-048-6. Summers-Smith, J. Denis (2005). On Sparrows and Man: A Love-Hate Relationship. Guisborough (Cleveland). ISBN 978-0-9525383-2-5. Wikimedia Commons has media related to Passeridae.